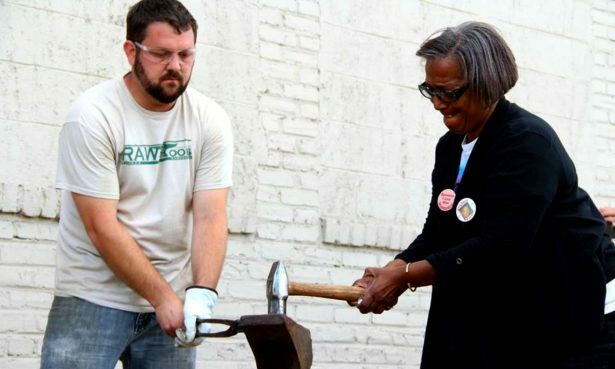 The RAWTools blacksmiths change weapons of violence into tools for life. Meanwhile back in the real world, 11 million guns are created annually in the USA alone, forget the rest of the world. Another useless feel good program. Do you own guns, man? Honestly, bruh, man don’t need guns. Guns not relevant and they just poppin kiddos in the schools. Mans doesn’t need the little roadboys popped in the poop shoot while they try to get a education. What man do need is a shank and an Adidas bag to carry man’s stuffs, ya get me? How’s man gonna do yard work wiv a AR15 when mans got a spade. Craig, you ain’t gang, ya get me? In the UK we ain’t got guns so no kiddos dying in schools. Mans got a shank but only so man is protected innit? That Mans facts not true tho.